Been looking to get in touch with your inner zombie? Do you identify best with your undead friends? Are you in the market for a jacket with a pretty wicked graphic scheme? Well if any of those questions apply to you then Icon's Decay Hooligan jacket may be just what you've been looking for. Icon is known for more bold and alternative designs and graphics. The first thing that stands out about this jacket is the giant decaying skull gracing the front. The ominous skull certainly makes for a bold look, and if that style's not what you're into then you probably stopped reading this after seeing the picture. If it is your style, you can rest easy since all the graphics are sublimated so they won't fade. As far as features go, the jacket sports a durable and breathable mesh chassis. It's armored with removable CE approved elbow and shoulder pads. Pocket space is pretty minimal but it's not designed to be an off-road or touring jacket. It also has a lined collar and an insulated, water-resistant liner to keep you warm on those frigid nights hanging out in the cemetery. 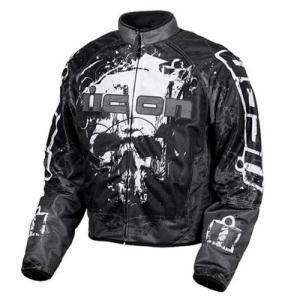 Icon is a pretty popular choice among sport bike riders. The company is known for quality products, and while this jacket isn't so rich on features, it is definitely rich in the style department. Not necessarily a bad thing if that's what you're looking for.